Re: talk me out of it. Just picked up a C-100 to replace an XF100. The C-100 has amazing image quality, low light capabilities, works with your Canon mount lenses, etc. I spent 6 months researching the purchase. I originally wanted a BMCC. I also looked into the HM600, Xf300, PMW-200, PMW-160, D800, 5D3, 1dx, 1dc, ac90, and GH3. I watched every bit of test footage from each that I could find. The BMCC was my first choice, but I don't want to wait another 3 months or have to send the camera back for the infinity focus correction. The C-100 seemed to have better image quality than everything else except the BMCC. Came close to getting an XF300 because of the quality and lower prices for this of late. The C-100 can hold the minute details of a wide-angle landscape scene. Resolution, some degree of modularity, and wide dynamic range were perhaps my acid tests. I am very pleased with the camera. It is certainly more "run and gun" capable than a DSLR, but does not come close to the camcorders like the PMW-200 and XF300 when it comes to shooting on the fly. Then there is the learning curve and getting your custom picture profiles tweaked to your needs. It's another great tool with its own set of limitations. Your always going to be stuck with limitations of one sort or another. Renting the C-100 for a day or so could be useful. Waiting to see what NAB brings is, as Chris and Omar have said, a great idea. I couldn't wait and want to be proficient with a new camera by late spring. I don't think Bill needs any confirmation to know the c100 is a good camera, it's more about if he should break the bank to get one. You have to admit that the c100 is expensive considering it sells without a lens. - No timelapse: yes, you can do timelapse on a DSLR, but they have issues doing 1-2 fps with longer (half second) exposures. Frustratingly, I find most of my timelapses need about 1-2 fps. EX1 was the bees knees at this, in combination with its Slow Shutter. - It looks like a funky DSLR to most people: so if you're filming events, shooting candids, getting voxpops, people tend to see the camera, turn to it and gurn (oops - pull the 'cheese' face) and not move until you patiently explain you're shooting video. At which point, they recoil in distaste at your deception. - You have to power-off to change lenses 'or dire things happen'. I'm not sure what they are, but it's scared the heebie jeebies out of me. - The 'last shot playback' in camera mode is mute. Sheesh, that provided a few 'moments'. - There's no 'Duration' display, so if the journo/talent asks 'how long was that?' you're down to doing maths or guestimating. Or, with reference to the previous point, switching to Media mode - which is 'so, like, five years ago'. These are, to be honest, niggles and whines which I knew about when I bought mine. Last edited by Matt Davis; March 3rd, 2013 at 06:55 AM. Sorry Julie. I won't be selling the mkIII either way. Matt, you've hit hard on one of the two issues preventing me from going to the local dealer this week and getting a C100. I don't want to make the more major investment on a C300 (or an F3/F5) until I feel that "the dust has settled" on the camera wars in that part of the price spectrum. But I've got two imminent jobs where I'd like to have the shallow depth of field from a large sensor for the interviews, but at 1,000+ lines of resolution. My EX1R gives me that resolution (the final product always looks spectacular on a large 1080p TV) but not the depth of field I'm after. My Rebel T3i is probably only capable of resolving 700-800 lines and that's why a C100 looks the choice for resolution and depth of field. a) But how bad is this interlaced problem with PsF? I've been working exclusively with progressive footage since mid-2005 and can't stand interlaced either. Is there a "special way" to bring the footage into FCP X so that you never get any traces of interlaced? And, if so, what are the steps? Also, does this PsF soften the resolution, or does it still seem sharp to you? Thanks. b) The only other uncertainty I have on the C100 is whether you can set the Picture Profiles to match up with an EX1R (as I'd probably shoot with both). For my corporate work, I use Doug Jensen's Picture Profiles for the EX1R, but I don't think Doug's come up with anything for the C100 or C300 to date (as far as I know). So I was wondering if anyone's tried to match footage from these two cameras and had any success? But how bad is this interlaced problem with PsF? You have to be looking close, and hard. I've had a few people tell me that I'm going totally OCD over this but there's something about handing over footage to another editor that makes me do this. I'm working on a hypothesis: that - unlike the FS100/700 - the C100 is capable of creating an image that contains so much detail that the AVCHD codec can sometimes run out of puff. The second 'flip/flop' sequence (the eye) demonstrates the interlace squiffiness. So, the grainy image is the first frame, I'm confident that it falls on an I frame. The following image is the next frame, which would be a P frame. It's in these 'pairs' of P frames that show the pseudo-interlacing when - and only when - the codec is under a lot of stress (like 18dB of noise and hand-held wobble-cam, or a really detailed image with lots going on). But I am still amazed at the lack of visible difference between the 4:2:0 and 4:2:2 from the C100 when the scene isn't too demanding. I tried 12 cycles of recompression to the XDCAM 422 codec on the pepper footage with no discernable quality loss, and that includes the AVCHD and ProRes-LT stuff within it. I was hoping to see some degradation, but this could only be seen in the WFM and Vectorscope. The 'fishiness' of the PSF is almost completely cured by converting the AVCHD to ProRes in FCPX, too. So it may be something to do with the way FCPX is interpreting the AVCHD - flicking through rushes at 200% magnification, frame by frame, looking for interlace artefacts in what should be progressive frames is a bit obsessive and sometimes 'you see what you want to see'. One thing - ONE THING - which we all see regularly, and is a true 'Mark of Cain' in any 4:2:0 footage, is a sort of sawtooth pattern along the edges of oversaturated reds (see attachment below), though it crops up in any area of strong colour. Nature of the AVCHD/XDCAM-EX beast, though the 'pointy' version seems to be unique to the C100. BTW, integrated C100 footage with Sony F3 and EX1 rushes with no issues - keep sharpness down (!! ), use CineGammas (1,3 ad 4), don't touch the colour stuff, use WDR on the C100 - they can be brought together very successfully. 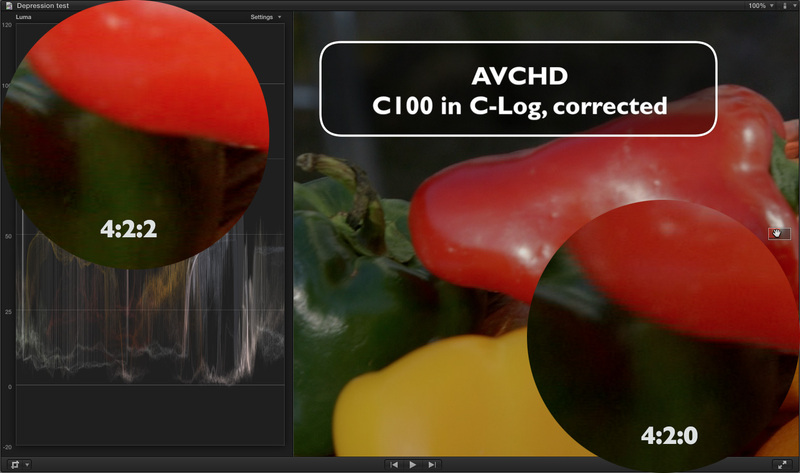 Recently had a comment from an editor that my C100 looks VERY like the F3 on XDCAM codec. If you can't afford a C100 but still want it, might as well aim higher and 'want' a C300, which just saw a $2,000 price drop. Thanks very much for that, Matt. It's good info. I see this on footages from my new C100 and I solve this problem (on WIN7 and AvidMC/Symphony 6.5.2) with reexport to XDCAM HQ codec (VBR 35Mbps 420, 1920x1080). Re-Import these files is about several second (Fast import on AvidMC) and result is ok. But I use this method only for selected clips. I think that this problem is an C100's AVCHD problem (the problem exist on various editing softwares). the 6d and HMC150, and just order today!! There's no question that you'll occasionally see those jagged edges (especially on really red things that are contrasted with their backgrounds when using internal codec when blown up). I noticed it in a ballet I recently did (using the internal codec). But, I find at least, that little issue to be MINUSCULE compared with all the amazing offerings of this C100. Last year I was shooting weddings with a C300 & DSLRs. In the end I sold the C300 & the main reason was that the image was so damn good that the footage stands out like a sore thumb. The image is good not because it is incredibly detailed but also the dynamic range is far better plus with zebras you get the exposure as good as possible anyway. The choice was between getting three similar cameras (by this time the C100 had shipped) which didn't make financial sense or selling the C300 & getting another 5D3. It's better for my uses to use a couple of 5D3s along with an XF105. The latter is a proper camcorder & is great for the unattended wide angle safety shot. It has more detail than the 5D3 so works well for wide shots but doesn't have the crazily wonderful amount of detail of the C300 (& presumably the C100). The 10X servo zoom is useful sometimes especially for getting the framing right. It has XLR audio & the image matches well with 5D3. The battery lasts for hours & it records 82 minutes of video on a 32GB CF card. I was hooked on the C100 until I actually used one. Early December a local rental place picked one up. They let me try it out in the lobby for about 20 minutes. Liked the image, like the body design but the viewfinder was awful, lack of frame-rates, no time-lapse, no 60p. With a slight hit on image quality the Af100 has similar and more features at less than half the cost. In the end I bought a DSLR and waiting until NAB. Have to agree with this. I have the AF-100 and enjoy those features. Canon should if it's possible add them in a firmware update.